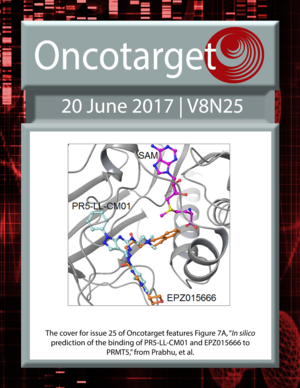 The cover for issue 25 of Oncotarget features Figure 7A, "In silico prediction of the binding of PR5-LL-CM01 and EPZ015666 to PRMT5," from Prabhu, et al. Is MPP a good prognostic factor in stage III lung adenocarcinoma with EGFR exon 19 mutation? 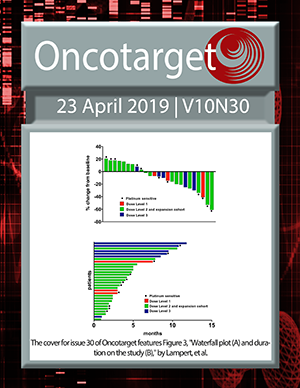 Anti-proliferative and anti-secretory effects of everolimus on human pancreatic neuroendocrine tumors primary cultures: is there any benefit from combination with somatostatin analogs?